The top of the South Island basks in a settled, year round climate and is blessed with a wide range of natural and cultural experiences. 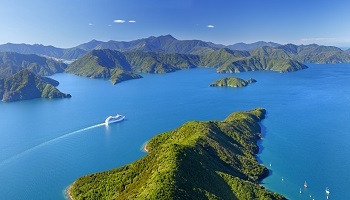 The Marlborough Sounds, a series of flooded river valleys now home to a wealth of bird and sea life, is one of the jewels in Marlborough's crown. 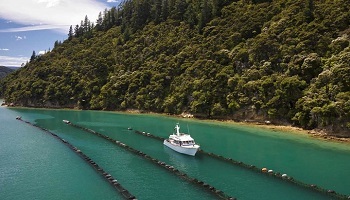 Made up of the Queen Charlotte, Kenepuru and Pelorus Sounds, the Sounds can be experienced with a range of boat trips, be it from a luxury charter launch or in a close-up view of the water's edge from the seat of a kayak. Admire the spectacular scenery where bush and mountains rise straight from the sea and settled, seductive bays beckon. 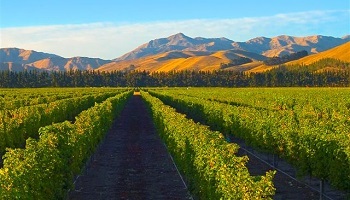 On shore, Marlborough and its main commercial centre of Blenheim are located in a wide river valley, which has proven to be perfect for growing grapes - not least of which is the flagship Sauvignon Blanc variety. Marlborough is New Zealand's largest grape-growing and wine-making region with 65 wineries, 290 grape growers and 4054 hectares/10,000 acres in grape production. The majority of the wineries are boutique operations with cellar doors and many have restaurant/cafe facilities on site. Alongside the many wineries are fruit orchards, also a prominent part of the landscape, as is the region's traditional sheep-farming base.